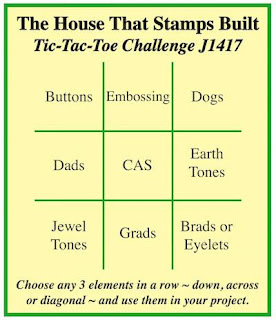 I'm back with a new Tic-Tac-Toe challenge for Repeat Impressions. come 10 to a package, and you can find them HERE. I chose CAS, and what is cleaner and simpler than having someone else cut and score your cardstock? Now it’s your turn! 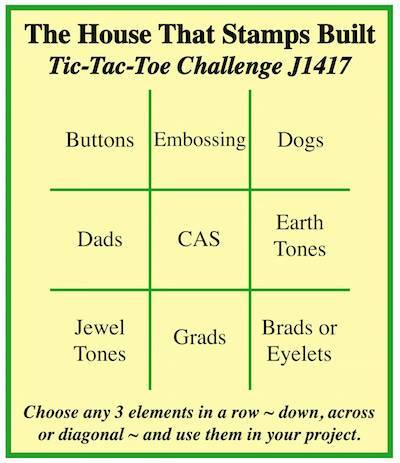 Create a card using the Tic-Tac-Toe board above, and link it up at The House that Stamps Built. Remember, your creation does not have to be made with Repeat Impressions stamps, but if you would like to include our designs we would love to see them! Plus, there’s an added bonus… you will get an additional entry in our random.org drawing for using our stamps in your submissions! drop by and give Shirley a warm welcome!!! Oh wow great use of not only this challenge but also the card - I think I might have a couple of those in my stash. Love this image - so sweet. Definitely cute and simple, but adorable! Great masculine card. What a created and fun card Patti! Like the background on the card too. Fabulous guy card Patti! This is perfect, I love flip cards! Gorgeous! Thanks so much for sharing. Gorgeous card Patti - your background stamping looks amazing! Beautiful work. I like how you stamped on the outside of your image. Nice image too. Great masculine card, which are so hard to make. You make it seem so easy. This is fabulous!! The swing card is so fun and I love how you stamped the background image; it looks perfect! A perfect card for Father's Day! Nice work, Patti.